On Thursday, we listened to a breakfast presentation about sauerkraut, cabbage, and plant pathology. It turns out that UW Madison created a department of plant pathology in response to a crisis in the growing of cabbage. Plants are something I don’t understand at all. The same goes for fermentation. It was therefore fascinating to go to the Great Lakes Sauerkraut factory, in Bear Creek (pronounced “crick” by the locals). It turns out that GLK Foods, which runs this operation, produces 95% of all the sauerkraut in America. You’ll see a few different brands of sauerkraut in your grocery store, but chances are it was all produced at GLK. Americans are not big sauerkraut eaters, but we do eat 1-2 pounds of the stuff per capita per year, on average. With 300 million Americans, that comes to a LOT of sauerkraut. I enjoy watching mechanical machinery. You can imagine an inventor pondering the best way to remove the core of a cabbage plant, and coming up with a machine to do that one job. It would need something to hold the head of cabbage, a guided coring blade, a place for the core to drop, an arm to throw the cored head somewhere else in order to receive the next one. Then, you’d need another machine to remove the outer leaves, another to do your shredding, and so on. The factory is a sequence of such machines – a compendium of clever inventiveness. And this cleverness makes a lot of kraut. 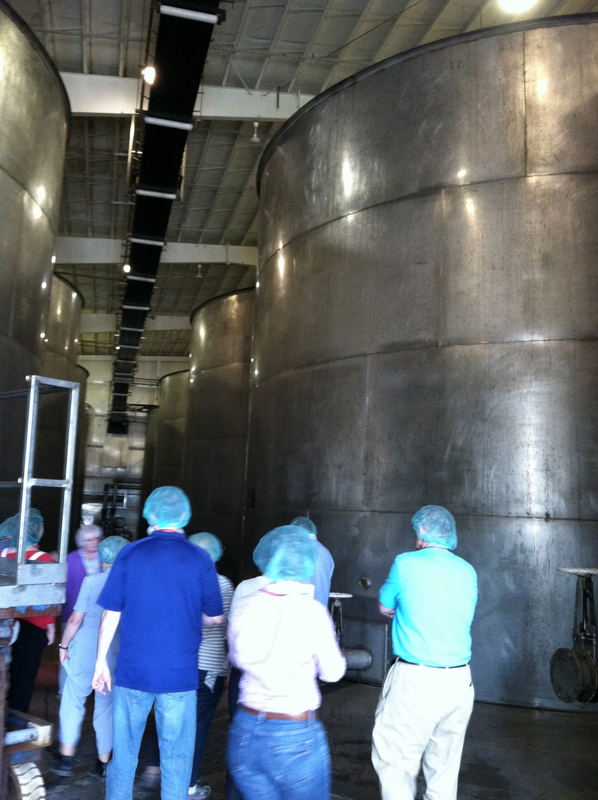 The tanks which hold the kraut while it ferments are huge and there are lots of them. This picture shows some but not all of these giant vats. After this year’s crop is harvested, these vats will all be full of fermenting sauerkraut. Given the low profile of kraut in my eating habits and those of most of my fellow Americans, the scale of this is truly amazing. Because not only is there a lot of sauerkraut being made and sold; the same goes for baked beans, frozen corn, ground beef, dried pasta, applesauce, maple syrup, soy sauce, and so on. The world is a hive of activity, of people making and selling stuff. All this while I sit in an office and teach people to play the horn. Pretty amazing. We next drove to Wautoma to visit Family Health/LaClinica. This is a clinic that serves the migrant workers of Wisconsin, of whom there are many. Although the name suggests rightly that there are many Hispanics who benefit from these services, we also have a large Hmong population in Wisconsin. In short, we’ve got lots of poor people from elsewhere who come and do lots of hard jobs for us for not much money. LaClinica takes care of these people. Not only have they raised money for a pretty nice facility in Wautoma, they also have a converted RV that goes around that part of the state and provides on-site medical care at farms. The lesson: there are noble people in the world, who devote their lives to helping those in need. It is always good to be reminded of this nobility. The rest of the day was a real eye opener. We drove to the Red Granite Correctional Institution, which is a medium security prison. On the way, Walter Dickey spoke to us. He is a UW emeritus professor, one of the people who uses DNA to absolve death row prisoners of crimes they didn’t commit. He is also the former director of the Wisconsin Department of Corrections. He is a guy who knows about law, prisons, and prisoners. First, a bit about the prison itself. Most of the prisoners have a small amount of mobility within their confinement. They have keys to their cells, which are tiny (and shared). They have 45 minutes of gym or outdoor time twice a day. They are required to go to school (inside the prison) to get a GED or HSED. The guards seem civil and pleasant. If you have to be in jail, it could be worse – this isn’t Lubyanka. It is, on the other hand, overcrowded, housing over 1000 inmates in a space designed for a maximum of 750. The question Walter Dickey raised is: what are prisons doing for us? Is public safety improving? He made the point that, when you lock up a drug dealer, a younger and more reckless one takes his place. As he put it, a stable drug trade is better than an unstable one, given that you can’t eliminate drug use. Long sentences, by pulling criminals out of society for so long, make reintroduction into society that much harder. This prison had basically no process for easing released prisoners back into society. Prisons are expensive to run, and draw a lot of resources that could be used to train future French horn players instead (ok, Dickey didn’t phrase it exactly that way). Anyway, this visit made me think a lot about what kind of society we are trying to have for ourselves. As usual, I reached no conclusions. After this grueling day, we drove to Milwaukee and ate at the Old German Beer Hall. Beer and pork proved the perfect combination to soothe a weary traveler journeying through the sadder parts of the great state of Wisconsin. Sleep was the perfect cap on the day. The final day began with a presentation on chocolate. It had been billed, in our itinerary, as a talk by Ambrosia Chocolate, an operation out of Milwaukee. As it turns out, Ambrosia is now owned by ADM. As in Archer Daniels Midland (“supermarket to the world”). As it further turns out, chocolate is an extremely industrial product. Not at the beginning of the process, though. The chocolate mostly grows in African countries and is harvested by hand, hacked open with machetes, and the pulp laid out to dry and ferment on mats. At this point, though, it is bought – almost all of it by ADM – and brought out to the coast and then to America and Europe. It undergoes an industrial strength processing, which I don’t totally get, but which involves separating out the fats (“cocoa butter”), grinding what’s left (that might be the nibs, but I can’t remember all the terms) to a fine powder, and then mixing the fats back in. Did you think chocolate was something lovingly prepared by grandmas in hairnets? I did. Wrong. Our final event was next: a talk and Q and A by Howard Fuller. I did not know about him, being an ignoramus, but he is a black educator who deals mostly with the problems largely of poor black kids in school in the inner city. He is controversial because he has espoused vouchers, and has (at least in the minds of some) been co-opted by the people on the right who (in the minds of those on the left) want to get rid of public schooling. I am being carefully non-partisan here. Anyway, Fuller begins with the idea not of schooling itself but of the kids. What do these kids need to improve their lives? He is not asking what society needs, but what the kids need. He is an advocate not for a particular style of schooling but for a particular group of kids. He stated clearly that he was not telling us what to think, but was telling us what he thought, and why. He was an incredibly charismatic speaker and clearly a guy who cared enough about poor black kids to not only devote his life to them but to face down a hornet’s nest of criticism from the people who would be his natural allies. In short, an independent thinker. As at every stop on the trip, my colleagues were filled with curiosity, asking probing questions and thinking as independently as Fuller himself. This was a talk that I will not forget, even though I have no idea what conclusions, if any, I will eventually reach. I returned home not only filled with new knowledge about the state, but with lots of new friends and a buzzing brain. What more could you want?